Another amazing week is ahead of us here at slatawoh studio…. Monday (thats tonight!) 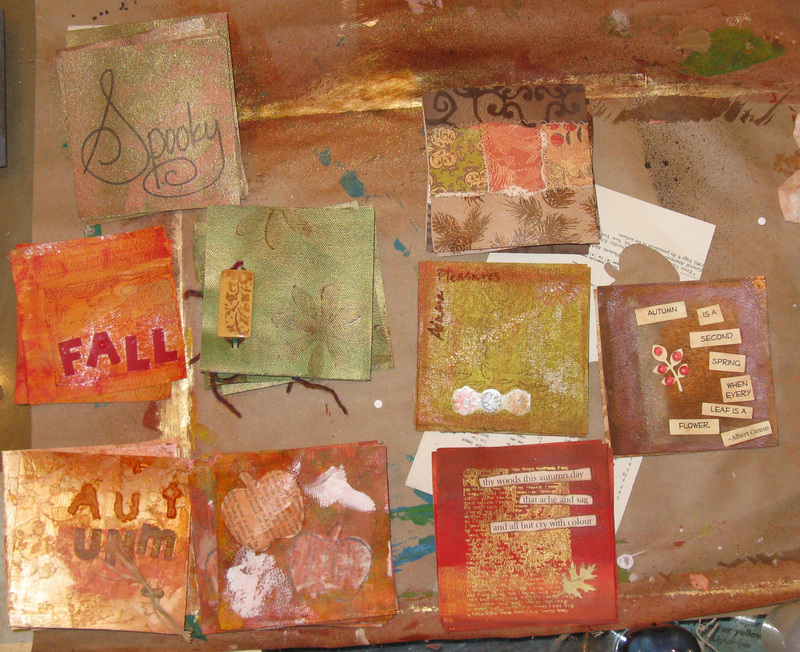 we’re working on autumnal (fall themed) chunky book pages. 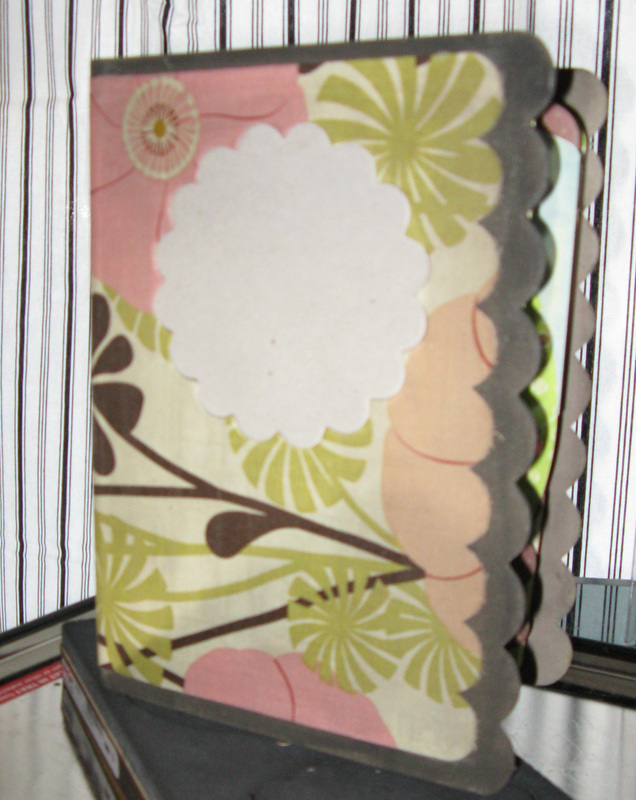 Create backgrounds and cut them into 4″x4″ pages that can be bound or pasted to larger pieces. Technique Tuesday this week is Beeswax….This medium fills the studio with such a yummy scent we’re spilling it over to our Lunch Bunch on Wednesday so if you can’t make it Tuesday night, plan your lunch hour accordingly and join us on Wednesday to use beeswax as your adhesive in creating a collage on canvas. 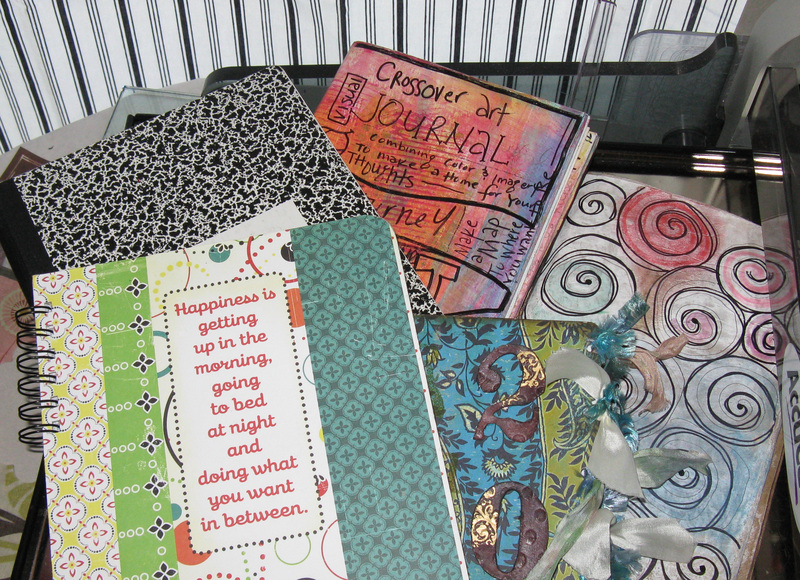 Wednesday night we’re doing an altered journal starting with a standard composition book you will add your selected papers and doo-dads, ribbon, fiber, grunge board….oh the choices….they’re endless. Make it however you like it. 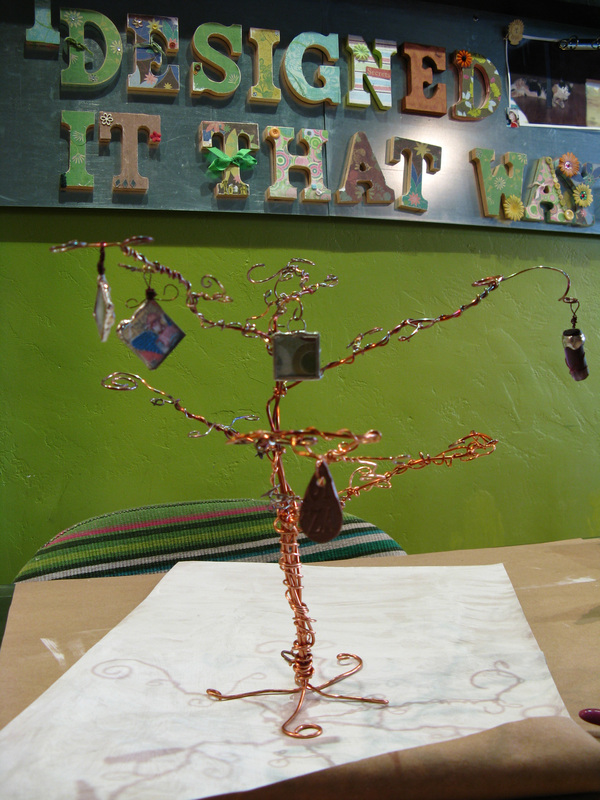 Set some time aside this Sunday to help me celebrate my birthday and make a Copper Countdown Tree….This wire tree will be a perfect table top addition to any spot you want to display things or even hang jewelry. Thats it for now…I’m off to check more items off my list. Hope to see you sometime in the near future. Posted by scraplovers in Classes & Craft Crave. Just a quick mid-week reminder about what’s happening in the studio! This has always been available, we just want to stress that you can come and do your own thing on Wednesday nights from 6-9pm. No instruction is provided, you just DIY and enjoy all the tools the studio has to offer. It amazes me how you can feel so connected to people that you only see a few times a year…Melodee is one of those people for me. Her incredible creativity and positive attitude inspires me in so many ways. Andrea and I are thrilled that she is coming back to teach again in the studio. Here are some sneak peeks and the schedule of her classes including the pricing! You can call the studio at 408-266-1005 to reserve your spot. This album is a 4 x 6 with 31 pages and can hold up to 90 photos!! To see this album you can check out this video! This is going to be one wonderful class! The album will feature a 2 page spread for each month along with a 6 inch tag. You will be able to bind pictures in between the pages too! Mel spilled that she had over 50 pictures in the book already! and a video which shows off the entire book!!! That’s all for the peeks…we expect that these classes will sell out quickly so if you are interested be sure to call us at 408-266-1005 to reserve your spot. If we sell our we do have the option of adding the most popular class as an evening class on Saturday. We are so excited about direction our workshops are taking. Both of us have had some deep discussions about what we want to portrait to our community here. One thing specifically keeps coming up over and over…we are the Jack-of-all trades, master of none sort of crafter. To us, it is all about the process. We are an “experimenting grounds” for participants try new things with whatever medium we’re using at the time. We learn as much from our “students” as they do from us. Monday Mixer is back and we’re playing with PMC tonight! Precious Metal Clay is a mixture of ground up silver particles suspended in a non-toxic binder with organic materials that make a clay-like substance. 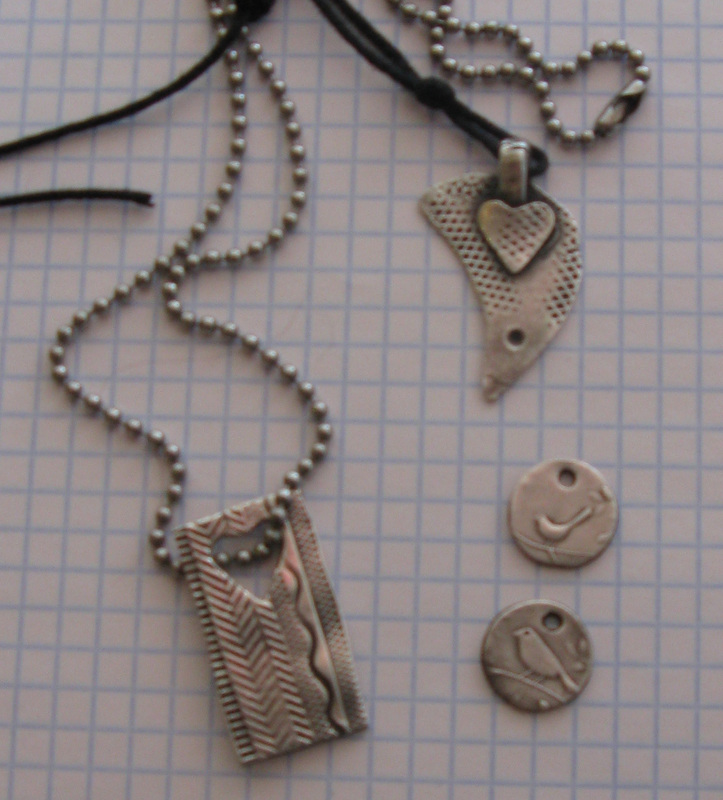 You will use PMC to make charms and pendants. Come learn the basics of working with this material and we’ll fire your pieces and have them ready for you by Friday. Technique Tuesday focuses on Polymer Clay this week. This is another medium that has great versitility. 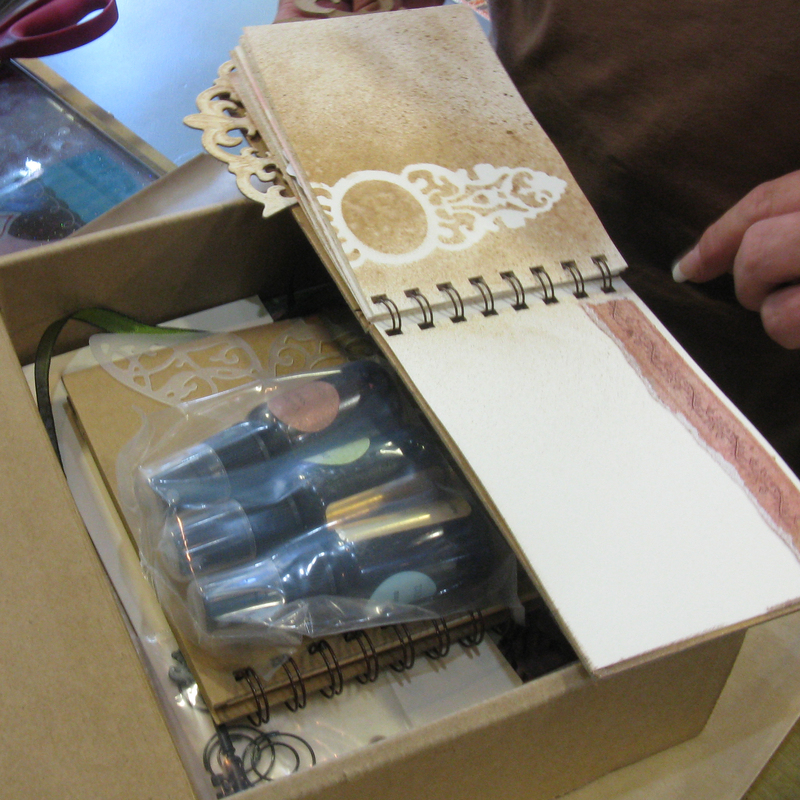 Use our stamps and texture plates on the surface and add pigment powders like Perfect Pearls to embellish. 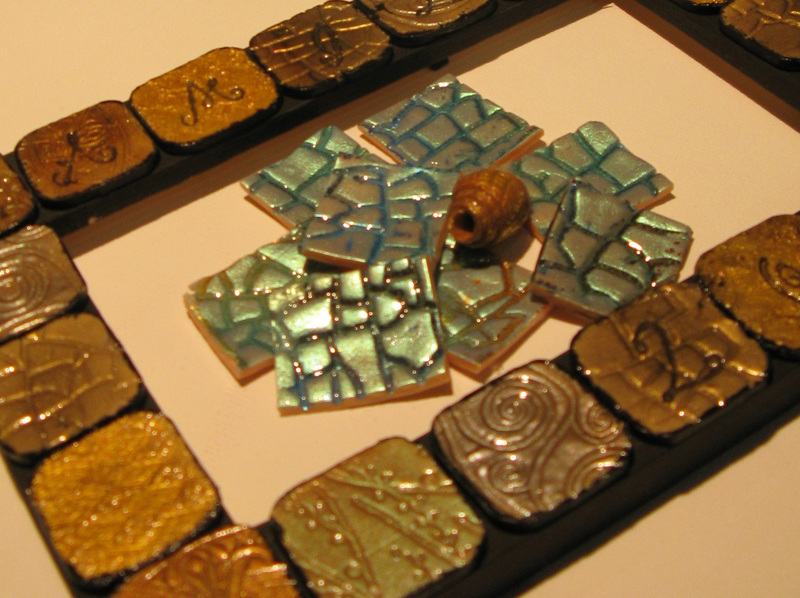 We’ll bake your pieces on the spot and you can take them to add to your future projects. Wednesday Lunch Bunch will be working with Polymer Clay as well. If you can’t make Tuesday night, here is a re-cap/mini workshop. 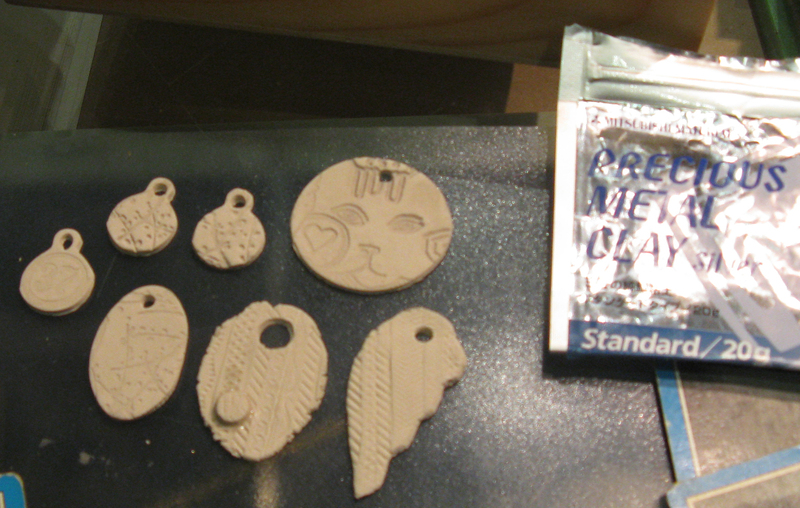 From 12-1pm bring your own lunch and make something with Polymer Clay. Learn to condition with the pasta machine, add texture, pigments and bake. 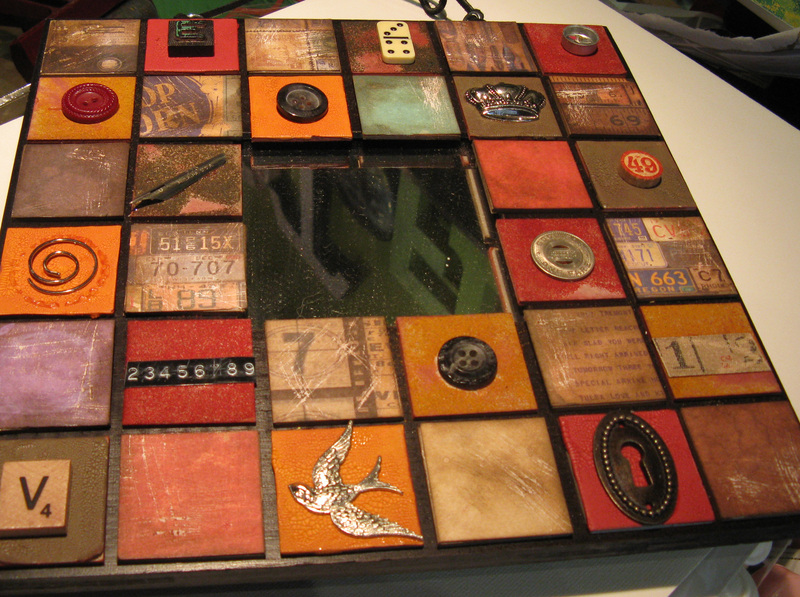 Altered Art Wednesday Night will feature our fabulous Altered Mirror. 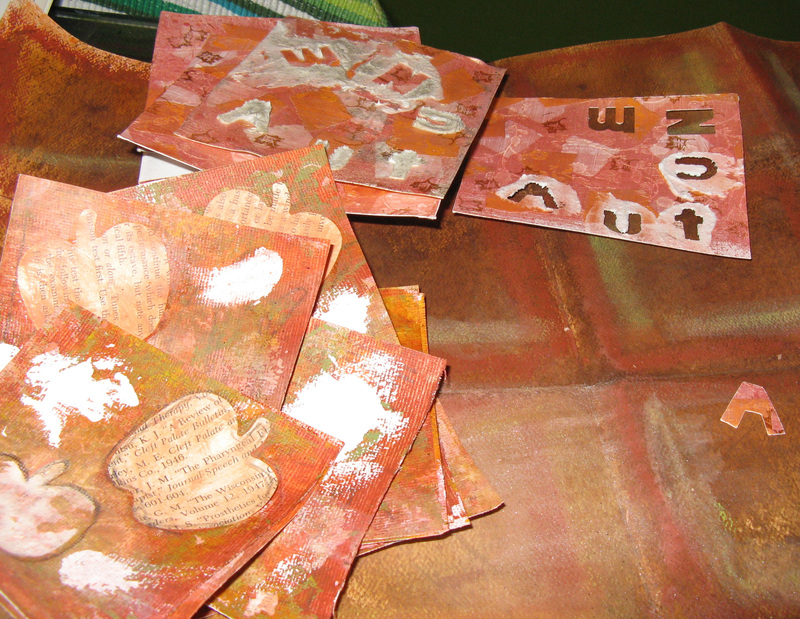 Cover 32 tiles with paper, crackle paint, ink, distress embossing powders and “doo-dads” to make it totally “YOU”. Choose your color scheme and theme or make a “blank canvas” to add a future collection to. The possibilities are endless. Extra kits are available since this project is addictive and sometimes one mirror just isn’t enough! Open Studio Wednesdays: This has always been available, we just want to stress that you can come and do your own thing on Wednesday nights from 6-9pm. No instruction is provided, you just DIY and enjoy all the tools the studio has to offer. Thursday we’re starting a 101 series every Thursday night. This is all about getting started (jumping with with both feet) This week we’re Soldering. 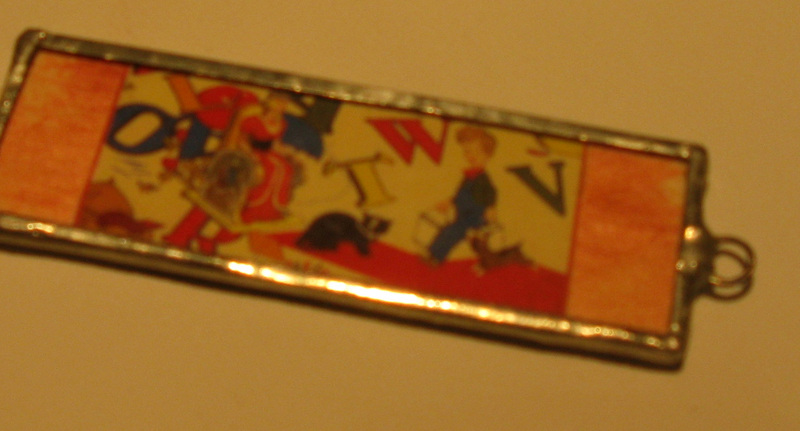 You will learn the basics of soldering taped microscope slides. If you know the basics, feel free to attend and work on more advanced projects such as box building and soldering jump rings. This is an activity you’ll want to do more and more to gain practice. Anyone else admire Sally Jean’s work? This is where it all begins. with Maya Road and Creative Cafe’. 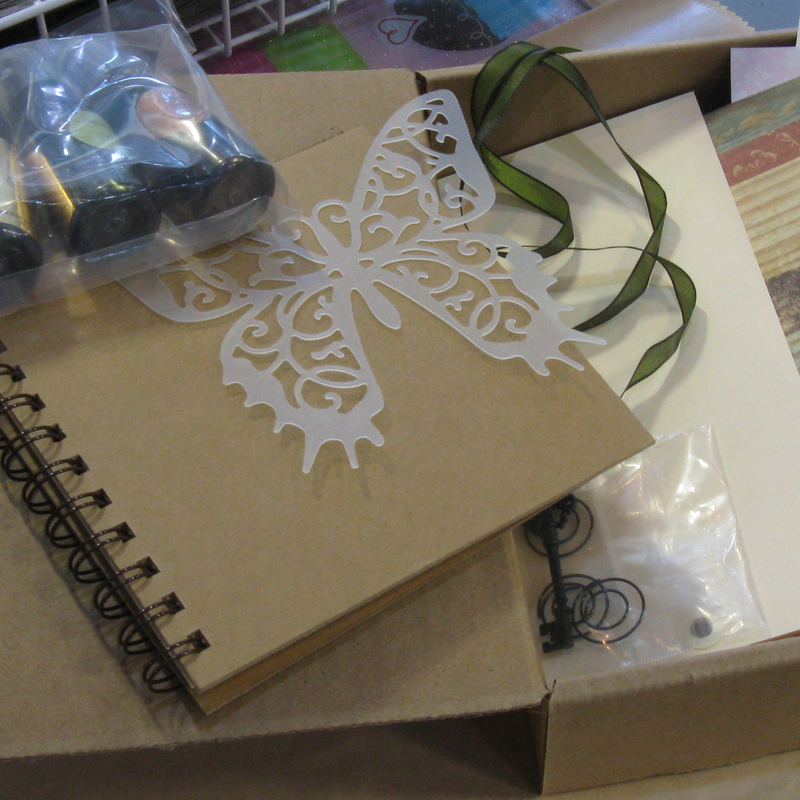 This is another project/workshop that offers kits. If you can’t make it to the Thursday night session, you can come in and complete the kit anytime the studio is open, or even at home. Friday is special because it is all about the kids in our lives. Kid’s DIY Studio is our youth program here in the studio. DIY studio for kids is from 3:30-5pm on Fridays. We have a nice group of upcoming artists and crafters in our midst. Each week we’ll focus on a new technique/skill and incorporate it into a project for the day. 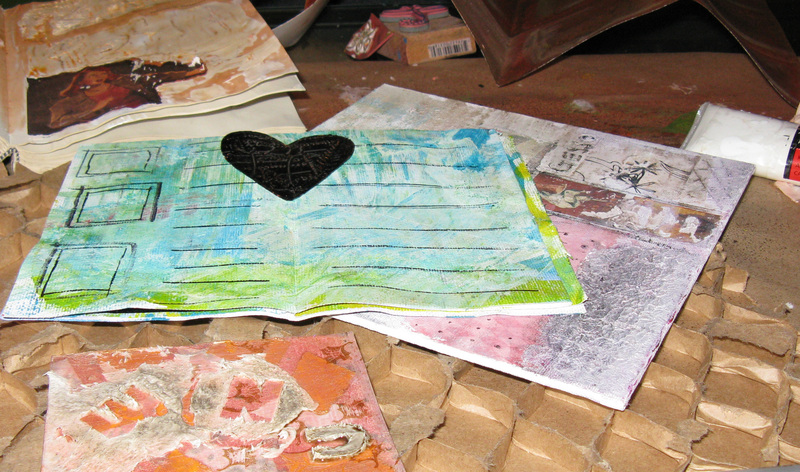 Kids 8 and up can complete the featured project OR work independently on whatever interests them. We will be rotating through 6 core lessons so participants can start the series at any point and not miss anything by attending 6 consecutive weeks. 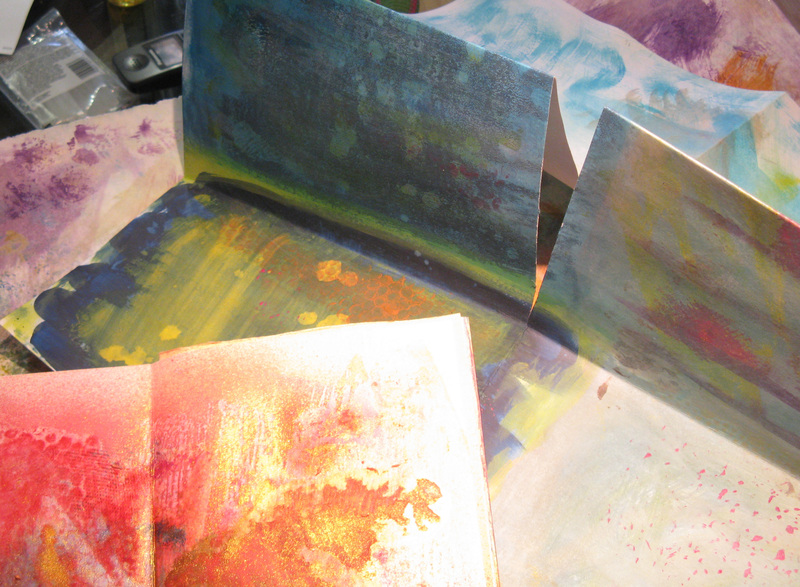 This week we’re learning about substrates and creating backgrounds with acrylic paints and texture paste. 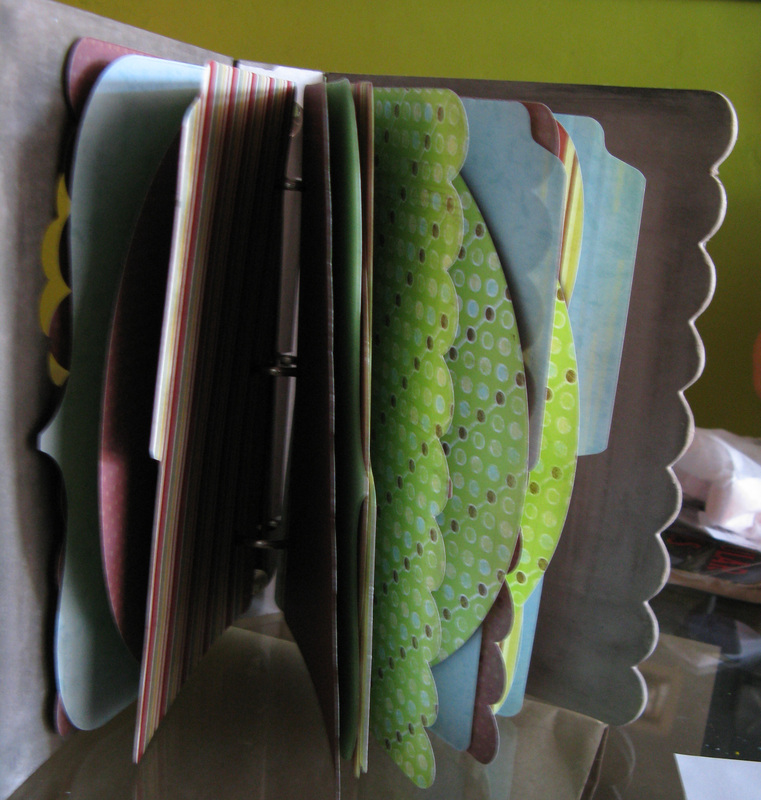 Next week we’ll work with book making, folding and binding techniques will be covered. Post a comment and you may win a free class next week! We’ll draw a name from all the comments on Friday and let the lucky winner know. Post a comment even if you can’t attend class. If your name is drawn you could win a class kit if you aren’t local. We still have room in class. Just give us a call to get on the list.